Habit: Perennial herb, subshrub, canescent. Stem: prostrate to erect, not twining. Leaf: entire. Inflorescence: flowers 1 in upper leaf axils, on +- 1 side of stem. Flower: calyx +- erect, hiding corolla tube; corolla lobes +- = tube; styles 2, stigma head-like. Habit: Plant tufted. Stem: 7--25 cm, much-branched from base, densely silky-canescent. Leaf: < 1 cm, +- sessile, elliptic. Inflorescence: peduncle short, bracted. Flower: 5--8 mm; sepals elliptic; corolla white, persistent, lobes ovate, acute; stamens, styles exserted. Seed: often 1, by abortion. Chromosomes: 2n=28. 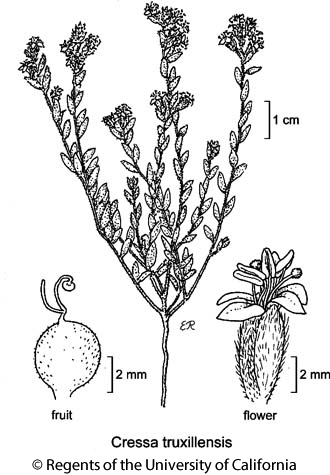 Citation for this treatment: Robert E. Preston 2012, Cressa truxillensis, in Jepson Flora Project (eds.) Jepson eFlora, http://ucjeps.berkeley.edu/eflora/eflora_display.php?tid=21017, accessed on April 19, 2019. GV, CW (exc SCoRO), SCo, ChI, GB (exc Wrn, W&I), D (exc DMtns); Markers link to CCH specimen records. Yellow markers indicate records that may provide evidence for eFlora range revision or may have georeferencing or identification issues. Purple markers indicate specimens collected from a garden, greenhouse, or other non-wild location.